My Audiobook Year and the Return of the Audiobook Flowchart – my books. my life. 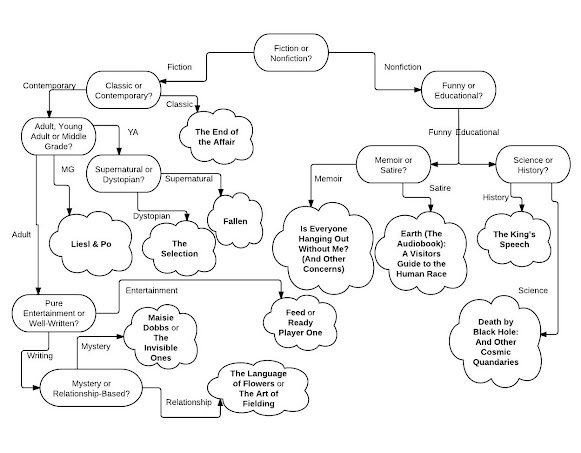 My audiobook flowchart was such a big hit last year, that I’ve decided to bring it back. Follow this chart (click on the image to enlarge it), answer the questions, and find your next audiobook. Links to the reviews for each are below. Let me know what book you get in the comments. Since last June, I’ve listened to 31 audiobooks. This chart includes some of my favorites from the past year (but not necessarily published within the last year). 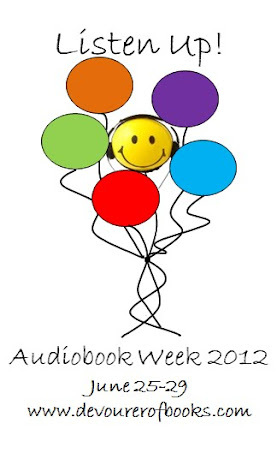 Make sure you check out the other Audiobook Week discussion posts over at Devourer of Books. Love the flowchart! I think the only audiobook I’ve listened to which is on it is “Is Everyone Hanging Out Without Me”, which I’m listening to now and loving. Have you read Bossypants? If you like the Mindy Kaling book, you’ll probably like that one. I haven’t read it yet, but I waiting for it at the library – long queue for the audiobook, so it must be good. I adore your flowchart! I listened to and loved THE END OF THE AFFAIR (narrated by Michael Kitchen), THE KING’S SPEECH, and THE INVISIBLE ONES. I’ve got to listen to READY PLAYER ONE! What am I waiting for? I don’t know. Read it immediately. It’s going up later this week. I love the flowchart! I’ve read at least half of those, but now I’m going to have to get to the others. I can not wait to listen to The End of the Affair. Love the flow chart! There is also a new version narrated by Colin Firth. I kind of want to try it. If you liked Bossypants, I think you’ll like this one. Love the flow chart! I read Is Everyone Hanging Out Without Me this year and really liked it. Flow chart is uber creative and I adore it. I’m a newbie to audio books so I’m always looking for suggestions. New to this blog but I’ll be reading up for sure. This flowchart is AWESOME! I read THE SELECTION in print. I despised the book, but I think I should have listened to it on audio, since I’m a big fan of Amy Rubinate. I’m reviewing that later this week. I actually ended up liking it but I can understand why one wouldn’t. Aren’t you clever! I’m thinking I missed this last year because I was overseas during this week. And of course this year I’m completely in the weeds with my kids and my family and didn’t do a single audio thing (except one audio review). Boo me. I missed half of last year when was also overseas. Very glad to be here for it this year. Hope you get to enjoy others’ posts at least. Oh, I love flowcharts. So tempted to flip a coin and follow it to my next listen. There are a few books here that I’ve really wanted to listen to but haven’t yet, including The Art of Fielding and The Invisible Ones. Both are very good choices. But neither have zombies. Love the flowchart!!! I haven’t listened to any of these, but I did read The Language of Flowers, which I loved!!! I love the flowchart. What an interesting idea! Ha!! Flowchart is awesome! I’ve never mapped out my listening before but it would be interesting. I’ve found that my listening tastes are somewhat different than my reading tastes. Mine vary from print to audio as well. I rarely read any nonfiction in print. I love your flow chart!! Very smart missy!! I love the flow chart! BRILLIANT!! According to the flow chart I need to listen to Ready Player One next. Will do! Thanks!! That was probably my absolute favorite from this part year. that’s a cool year! I plan to listen to Real Player One. I love your chart, and ended up with The Language of Flowers, which I did enjoy a lot. You are definitely in for a treat with Ready Player One. I see a couple of my favorite audiobooks on your list! The Art of Fielding, Fallen, The Invisible Ones and The King’s Speech. First time through, I got Ready Player One or Feed, both of which I loved, although I did read Feed in print. Second time through, I got The Selection, so I’ll have to see if my library has that one. Cool idea! I saved it! No idea why it went to spam. Hope you enjoy The Selection if you end up listening – my review will be up later this week. That flow chart is pretty awesome! Great listening suggestions! AWESOME! I must try Maisie Dobbs. Pingback: The Audiobook Flowchart Strikes Again | my books. my life.